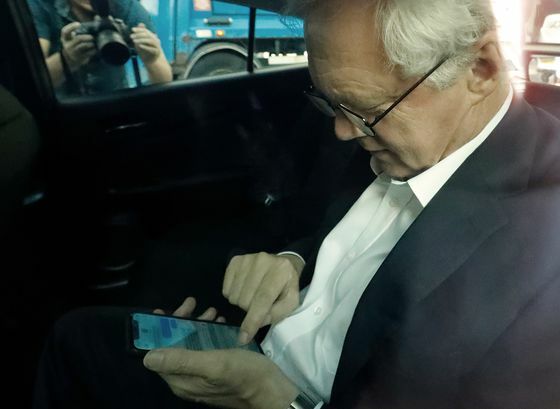 U.K. Prime Minister Theresa May moved quickly to contain a crisis in her government after her chief Brexit negotiator quit, replacing him with a young euroskeptic and insisted she would press ahead with her vision for the divorce. 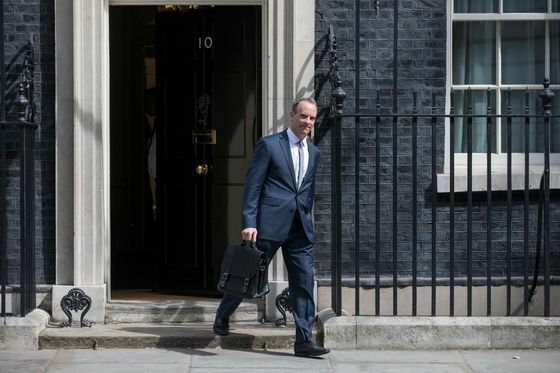 May appointed Dominic Raab, 44, as Brexit Secretary after David Davis resigned late on Sunday in protest over her plans to maintain close ties to the European Union after the split. He is relatively inexperienced, a Brexit supporter and a potential leadership rival -- but probably not just yet. Read our snapshot profile of the man who will take over Brexit talks for U.K. The immediate danger for May appeared to recede as pro-Brexit lawmakers held back from calling for her to go, emphasizing instead the need for a new policy. May took the highly unusual step on Monday of getting her chief-of-staff to brief Labour lawmakers on her plans for Brexit, an indication she could be looking for support from the opposition. The pound strengthened as May’s spokesman told reporters she would press ahead with the plan agreed with her Cabinet on Friday to maintain tight links to the bloc in order to protect vital business interests. That agreement of her fractious Cabinet, at a lock-in at May’s countryside retreat, came after companies stepped up their lobbying efforts with warnings that severing ties to Britain’s biggest trading partner -- as the Brexit backers want -- would be devastating for jobs and investment. If May rides out this crisis -- as she has many others -- she will face another showdown later this year when she brings the Brexit deal she negotiates with Brussels back to Parliament for approval. At that point, pro-Brexit Conservatives could vote against the agreement, potentially bringing down the government and throwing the last stage of talks into chaos. May doesn’t have a majority in Parliament so every vote counts. Just nine months before Britain is set to leave the European Union -- and 15 weeks before a deal is meant to be signed -- May appeared to have reached a landmark deal with her Cabinet on Friday. She stamped her authority on her government and told ministers to back the plan for close ties to the bloc or leave. Davis and his deputy resigned in protest against the blueprint, which keeps the U.K. bound to EU rules on goods and food after the divorce. Davis said it risked breaking campaign promises, would trigger more concessions, and could end up with Britain staying in the single market and customs union. The double resignation prompted calls for a change of direction from pro-Brexit lawmakers, but they didn’t call for her to go. Jacob Rees-Mogg, who commands about 60 hardline euroskeptics, said a confidence vote wasn’t in the offing and said he thought May would still be premier in March, when Britain is due to leave the bloc. He called a meeting of the group on Monday. The other big Brexiteer names in Cabinet remain in place. Trade Secretary Liam Fox put his name to a newspaper article backing May’s plan, and Environment Secretary Michael Gove defended it in a TV interview. Foreign Secretary Boris Johnson, the face of the Brexit campaign, is also staying put to defend his vision of the divorce, according to a person familiar with his thinking. May meets lawmakers later this evening.